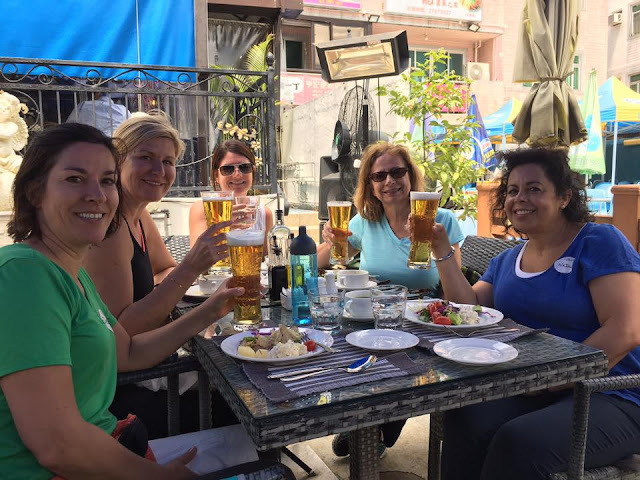 I love a good bike ride (like this and this), but it's even better on a gorgeous day with a gorgeous group of fellow expats from the American Women's Association. I joined a group of 15 women for a 21 km bike tour on the outskirts of Hong Kong. When I say outskirts, I mean just a 30 minute ride on the MTR from Central, but it feels like your a million miles away from the city. I started my day with a couple of scrambled eggs ---> needed that protein for a bike ride! I also packed some light snacks and plenty of water for the trip. It's best to be prepared, even when lunch is planned at the end. We picked up our bikes in Tai Wai. Only $60HKD to rent the bikes! There are lots of bike shops, but this was one that we could pick up and drop off at different locations. I wasn't expecting a mountain bike, but it worked fine. Our AWA coordinator, Regine, recommended that we take the bike for a spin near the shop before leaving to make sure everything worked. Our bike tour was not the Tour de France, but an enjoyable ride along the Tolo Harbour. It was simply lovely riding along the water, seeing the mountains rise behind the apartment buildings, and soak up the sunshine. At Science Park we made a water stop and took in the views of Wong Leng and the Pat Sin Leng mountain range across the harbour and where we would end our bike ride. A week ago I had been on top of that range looking down at the Guan Yin Statue. In Tai Po, we stopped to see the Tai Wong Yeh Temple located basically right on the bike path. It was a pretty place for another water stop. In some places the path veered away from the water, but offered a very pleasant bit of shade. It was so peaceful riding along under the trees. Eventually we arrived in the village of Tai Mei Tuk. This part of the ride was much busier with cars and pedestrians on a much narrower path, but we reached our destination without harm to anyone. You know you have arrived when you see all the bikes lining the path and an assortment of restaurants lining the parallel side street. After returning our bikes, we walked a little way to a very friendly Italian restaurant, Jack's Terrazza, that offered an affordable set lunches menu. Clearly, I was at the party table. Tall glasses of Carlsberg for (almost) everyone. I'm not a beer drinker. It was a long, but fun day. Today I had another meeting in Central, but this time mrC came along so we could run some errands after. Like, getting acai bowls from Be-Juiced on Peel Street. What's in my bowl? peanut butter, apple granola, and kiwi. SO GOOD! mrC had blueberries, banana, and honey. He loved it. After our light lunch, we hit up A&M (the US groceries store) and J Crew (where I snagged this awesomely soft long sleeve tee) before heading back on the ferry. We had a 30 minute wait, so it was a good thing I brought the YPPs with me. It was an early Taco Tuesday for dinner at our house. How about you?